We are manufacturer and exporter of mild steel silo, fly ash storage silo, lime storage silo and cement storage silo. As a leading provider of a wide range of heavy industrial products, Pneucon proudly acclaims that it offers some of the best silos in the industry. 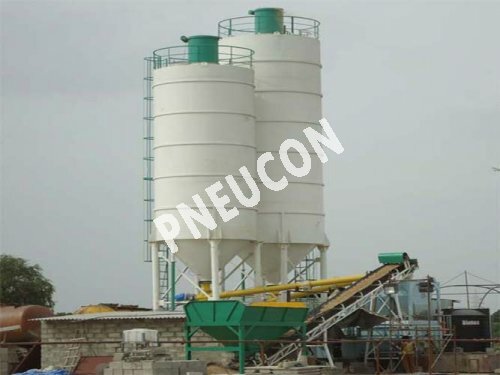 We are a professional and a reputed manufacturer of various products like a mild steel silo, fly ash silo among others. Being completely aware of what our clients demand from us, we not just provide efficient mild steel fabrication and heavy fabrication services that meet or even surpass our client&apos;s expectations, but also put in the right amount of efforts to ensure the entire process is sped up and also is cost-effective for us as well as our client. To ensure we provide maximum satisfaction to our clients on all fronts, we implement the latest technology, advanced techniques and out-of-the box ideas. These cancel the need for unwanted cuts and steps which may eventually weaken a particular product or restrict the product&apos;s application. For metal fabrication, CNC machines are put in use. CNC machines enable carbon steel fabrication experts and specialists to create accurate and finer cuts. These machines make use of advanced computer software programs like CAM or CAD to accurately decide which locations and tools to drill, cut, etc. so as to ensure a perfect product is created. These machines are designed such that they can efficiently multi-task with several complication operations like cutting out the basic shape, drilling holes, punching, grinding, welding, bending apart from executing several other critical operations. 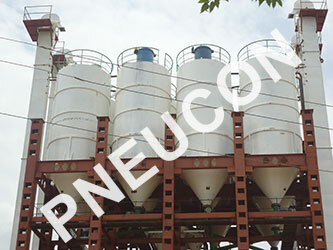 Pneucon is a reputed name in the manufacture and supply of high quality range of fly ash silo and mild steel silo. The range of mild steel silo offered by us is created by using supreme quality, high-grade material at our state of the art infrastructure plant which is well equipped with the newest tools and advanced machines. Our mild steel silos are designed for bulk filling uses in a wide range of capacities. Not just mild steel silos, we also have comprehensive infrastructure for manufacturing fly ash silos. We manufacture a wide range of fly ash silos. These fly ash silos are designed for bulk filling application in exhaustive capacities. We use supreme quality, durable raw materials for manufacturing fly ash silos which are popular in the industry for their no-contamination surface and durability. Our fly ash silos are low on maintenance and feature and a prolonged working life. These are designed in such a way that there is no possibility of cross contamination. For On sites of construction and industries, cement silos are used to store large amounts of cement or cement mixtures. Such silos come in a number of shapes and sizes which makes cement silos all the more accessible and suiting to the needs of the construction site or the industry. Cement silos can either be permanent structures, strong and rigid, or even they can be made on temporary basis making it more flexible and portable. Like a host of other silos, even cement silo is equipped with a kind of blower which helps to expel the stored contents into the truck or any other receptacle. 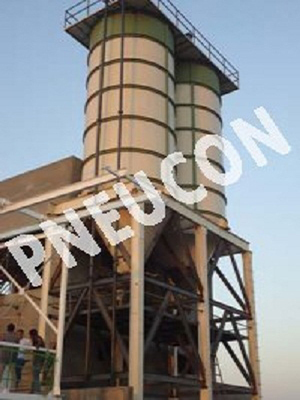 Pneucon has a range of low-level and upright Cement Silos, which are used to hold and discharge cement and other powder materials. The range of low-level Silos are fully-mobile with capacities from 10-80 tons. They are simple to transport, easy to set up on site and come equipped with an electronic weighing system with digital display and printer. This allows any quantity of cement or powder discharged to be controlled and also provides an accurate indication of what remains inside the Silo. These are a low-maintenance, value for money option for the storage of cement or other powders. All cement Silos in the range are perfect for use in conjunction. 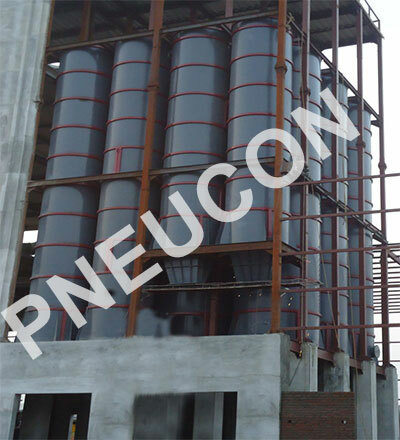 Since the time Pneucon has been launched, we have continued to provide unparalleled and exceedingly good quality services when it comes to making a grain storage silo or a maize storage silo. We are completely involved with the installation, manufacturing and the design of the silos and cater to the client?s specific requirements when it comes making silos of different specifications as well as different models. Copyright 2015 Pneucon Technology.Designed By:- GBC Infotech Pvt. Ltd.